The Darebin Falcons and Melbourne Uni will again we taking part in the VFLW Pride Game on the 19th May 2019. The match will recognise and support the LBGTQIA+ community by celebrating inclusiveness, gender diversity, and welcoming all people no matter their sexual orientation. 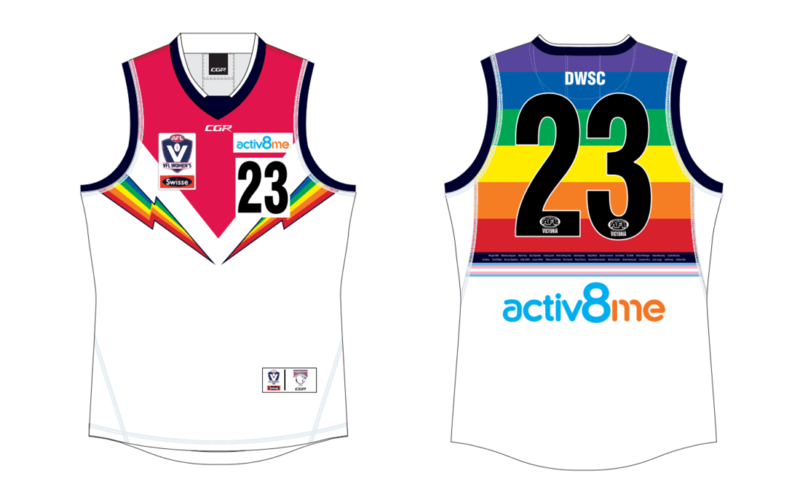 Both teams will be wearing rainbow-themed guernseys and we are excited to release this year’s design. This year, the Falcons have again incorporated both the LBGTQIA+ and Transgender Flags to recognise and show support to these communities. “The Darebin Falcons are dedicated to providing a safe and inclusive club for our players, coaches, staff and fans and we are honoured to be taking part in the VFLW Pride Match once again” said Sarah Brady, D.W.S.C, Club President. The 2019 Pride Match will be hosted by Melbourne Uni at University Oval. Melbourne Uni will also be hosting a luncheon prior to the match, with guest speakers including the AFL’s General Manager of Inclusion and Social Policy, Tanya Hosch, Gender and Sexuality Commissioner, Ro Allen and North Melbourne Football Club AFLW player, Emma Kearney. More information regarding tickets will be released soon. The 2019 Pride Guernsey will be available for purchase through CGR Sportswear. More details to follow.